From: The name of the source linked account from which the document was published. To: The name of the destination linked account to which the document was published. By: The name of the user who last published this document. On: The date and time on which this document was last published. Log entries. 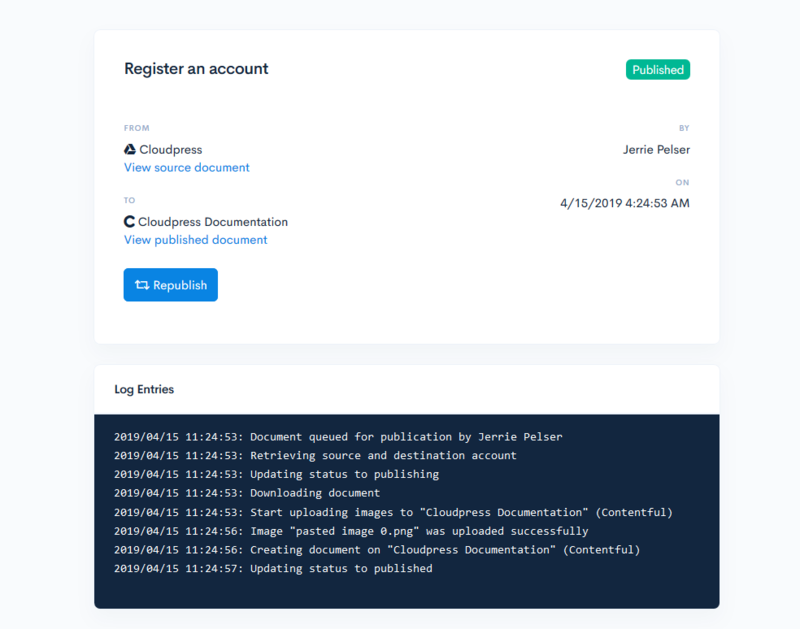 When publishing a document, Cloudpress will keep a basic log of all the actions which were taken during the publishing of the document. These log entries are displayed in this section. Under most circumstances, these log entries serve an informational purpose only. However, if an error occurred while publishing a document, this information can be useful to try and track down the reason the publication failed. If you want to re-publish this document, you can click on the Republish button. This will overwrite the content of the document on the destination account.